We’ve had a mad scramble to get our latest Hindi crossword puzzle out just in time for Holi. Happy Holi dear readers! 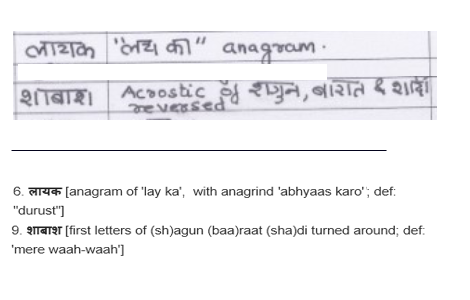 Kishore (aka Incognito) and I present our sixth collaboration over Hindi cryptics [previous Hindi puzzles here: 1, 2, 3, 4, 5]. This has been months in the making - we have had our debates about what is obscure and what is common knowledge, what needs ि and what needs ी, how to enumerate consonant conjuncts (more on this later) – and we have learned a thing or two in the process. The finished puzzle now stands before you. Hope you have fun with it! Send in your completed entries to shuchi [at] crosswordunclued [dot] com, with the subject line "Hindi Cryptic Crossword 6 – Solution", latest by Friday 29th March 2019. Entries should be legible and readable in a standard text or image reader (Word, Excel, PNG, etc. all fine). You can hand-write the answers with annotations, and send a scan if that works for you. If you have questions related to solution submission, please post them in the comments section. The winner can choose gift vouchers on Amazon IN/US/UK, worth INR 1000 (or equivalent in USD/GBP). The solver with the maximum correct answers, correctly annotated, will win. In case of ties, the winner will be picked by a lucky draw. The solution to the crossword and the winner's name will be announced in a follow-up post after 29th March 2019. Edited: 4a for wordplay, 5a for spelling. Thanks @p1j, @hg6. Much awaited puzzle! Thanks Shuchi and Kishore. Lovely puzzle Shuchi & Kishore !